Weekly, 7:15 to 9 pm Tuesdays. Followed by fellowship. Love offering. 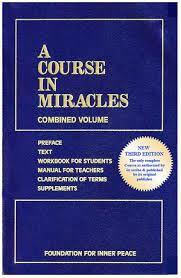 A Course in Miracles is a systematic, divine order of education that reveals our innate perfection. It consists of three volumes: Text, Workbook for Students, and Manual for Teachers. There are 365 lessons, one for each day of the year. Reading the Course invokes within you energies that you may never have been sensitive to before. Therefore, it is to be lived and not just to be read. “This is a course in miracles. It is a required course. Only the time you take it is voluntary. Free will does not mean that you can establish the curriculum. It means only that you can elect what you want to take at a given time. The course does not aim at teaching the meaning of love, for that is beyond what can be taught. It does aim, however, at removing the blocks to the awareness of love’s presence, which is your natural inheritance. The opposite of love is fear, but what is all-encompassing can have no opposite.